Call it what you will, I do not reason with my sartorial desires, instead, I patiently wait and seek out the items that fill the void. But, when money is a factor, the wait can be a long one. However, I confidently endorse these Asos jackets are as perfect options to fill your need to obtain a quilted jacket or, maybe, just a cool sporty bomber is what you are looking for! (Especially because all three options are under $100!). UPDATE: H&M now has the perfect quilted bomber jacket (though they call it a pilot jacket) available! UPDATE 2: As stated above I firmly believe in the patient pursuit of the perfect item. My belief further reinforced when I serendipitously came across the jacket aka April, May's Bono Quilted Leather Jacket in a bright red marked down 70% off at Shopbop!! What more can I ask for?! Click, click, purchased and now we wait for the UPS man to deliver! 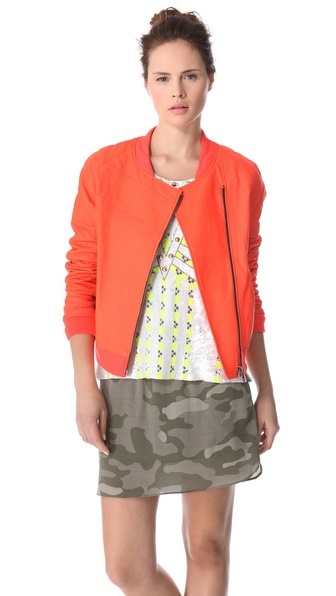 ASOS Bomber Jacket In Quilted Fabric $84.38 (image via ASOS). Never be afraid to borrow from the boys!